COLOGNE, Germany (BRAIN)—Soaring metal prices are causing a shift to lighter and more powerful electric bike batteries much sooner than anyone expected, a leading e-bike researcher said. MEQUON, WI (BRAIN)—Hayes Bicycle Group is completing its acquisition of Answer Products, SunRinglé and Wheelsmith Fabrications by transitioning the three brands to a 110,000 square-foot manufacturing facility in Milwaukee, Wisconsin. SANTA FE SPRINGS, CA (BRAIN)—Pro-tec recently announced that both BTI and QBP have been added to its growing list of distribution channels for 2008. LAS VEGAS, NV (BRAIN)-Swagger recently announced details of the Bicycling Magazine Industry Cup, scheduled for Thursday night, September 27 at the Mandalay Bay Resort in Las Vegas. The event is part of the World Criterium Championship, the final race in the 10-city 2007 USA Crits Championship Series. GRAPEVINE, TX (BRAIN)—Enthusiasts are clamoring for high-end mountain bikes. Strong sales figures in the first half of 2007 from bike shops and high-end companies indicates a strong growth trend. The only problem is that a large number of consumers have yet to receive their bikes. DALLAS, TX (BRAIN)—Former Hans Johnsen employee Bob Fowler passed away on September 14. He worked at the company for 50 years, retiring as senior vice president of sales in 1995. MEQUON, WI (BRAIN)—The Hayes Bicycle Group (HBG) recently added two new members to its marketing department, led by marketing manager, Joel Richardson. AUSTIN, TX (BRAIN)—Rocket Science Sports recently announced a new sponsorship with the AEG-TOSHIBA-JetNetwork Pro Cycling Team, marking its expansion into the cycling industry. BOULDER, Colo. (BRAIN) — With the Selling Cycling staff training program scheduled for a complete updating for 2008, founder Ray Keener is looking for input from retailers on the topics to be covered. "These are harsh times and it calls for a harsh beer. Pabst Blue Ribbon is just the thing. It is not shoved down your throat with multi-million dollar mass marketing, it is simply a decent cheap beer. This beer is America whether you like it or not. FRIEDRICHSHAFEN, Germany (BRAIN)—Heavy construction machinery has been put to work now that the expansion of the Eurobike exhibition grounds is in full swing at the East Entrance. SANTA FE, NM (BRAIN)—Dust off your GoGo boots and dig out your pedal wrench, the second annual Bike-A-GoGo is on its way. POZZOLEONE, Italy (BRAIN)—There’s a reason why, after twelve years of Outdoor Demo, no one has ever served ice cream in the desert. It is not a task for the faint hearted. TRENTON, NJ (BRAIN)—Recently at the Mountain Bike World Championships in Fort William, Scotland, Julian Absalon collected his fifth consecutive cross-country title. COLOGNE, Germany (BRAIN)—IFMA organizers say they plan to push ahead with incremental changes for future shows, despite disappointing attendance at this year’s show that ended Sunday. “What the show needs is a little ‘quietness,’ so you don’t change it every year,” IFMA spokesman Karsten Deicke said. 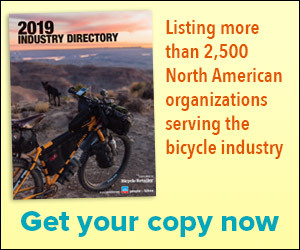 SUFFOLK, England (BRAIN)—Ultra Motor, a British e-bike manufacturer, has acquired American Electric Cycle and Fitness, a company owned by longtime e-bike veterans Ed Benjamin and Mike Fritz. BOISE, ID (BRAIN)—Ariadne Delon Scott, director of advocacy and the environment for Specialized, and Sabine Dukes, founder of Velo Bella, will be honored at the OIWC Gathering, Thursday, Sept. 27 at Interbike.